When you talk about modern homes, each and every little thing is taken care of. As in you just don’t go about taking into consideration the living area, bedroom infact each and every corner is given due attention. From the staircase to the attics, bathroom every nook and corner of the modern home is so well designed that it gels well with the overall design. Now, when we talk about bathroom, smallest products like faucets are being chosen with extra care. For this very reason, designers all over the globe are working hard to come up with smart options for today’s consumer who is going bit picky. Days back we came up with some really cool Kakudai Unique Faucet Range For Modern Homes. 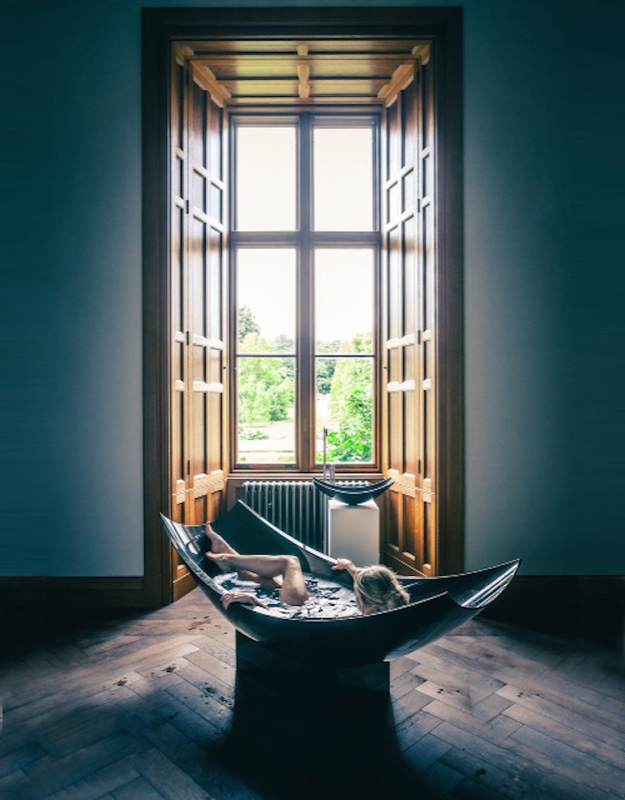 With the hope that you all liked the collection here we are with yet another list of most unique bathtubs that you all would love to check out and make your pick to compliment your modern home. Hit a jump to sneak a peek at unique bathtubs that promise to sit in your bathroom to give it a touch of elegance. 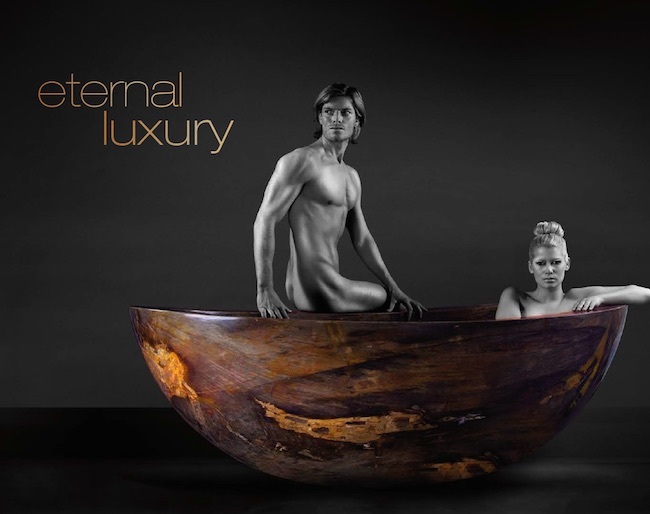 This one is the most expensive and luxurious bathtub in the world that is made after 4 years of work, 600,ooo working hours for searching that unique material, 300 days of transportation from the jungle, 3 months of CNC carving and polishing costs of 550,000 Euros. This is only one piece in the world created by Balki and made by a single block of rock crystal found in the Amazon rainforest of Brazil weighing more than 10, 000 Kgs. 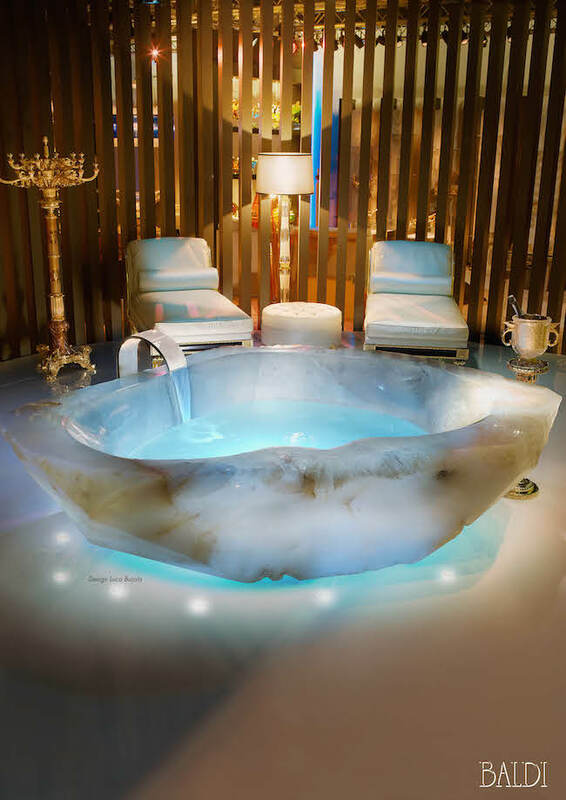 This is one of the most expensive bathtub that will cost you 1 Millions Euros to make it own. 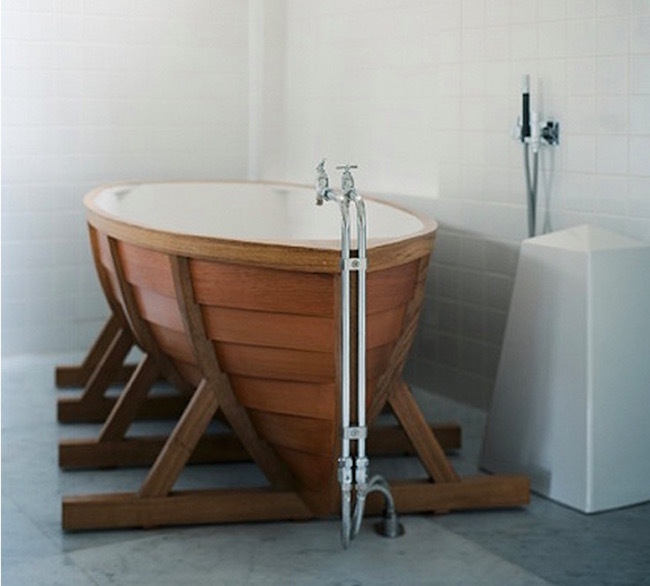 A unique bathtub by Maison Valentina that I liked so much and did the separate article on it sometime before. 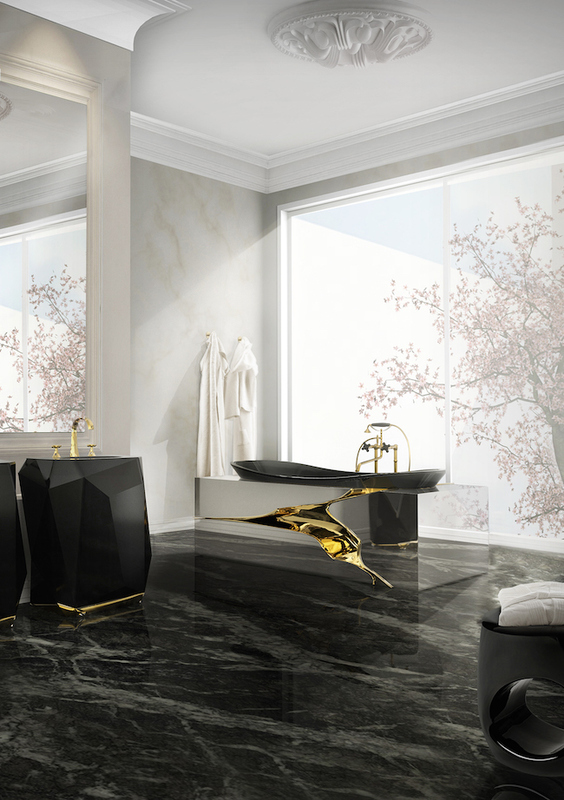 This is ultra an luxurious bathware collection that has Diamond freestanding washbasin, Lapiaz bathtub and Erosion Stool that you’ll love to buy and place in your luxury bathrooms. 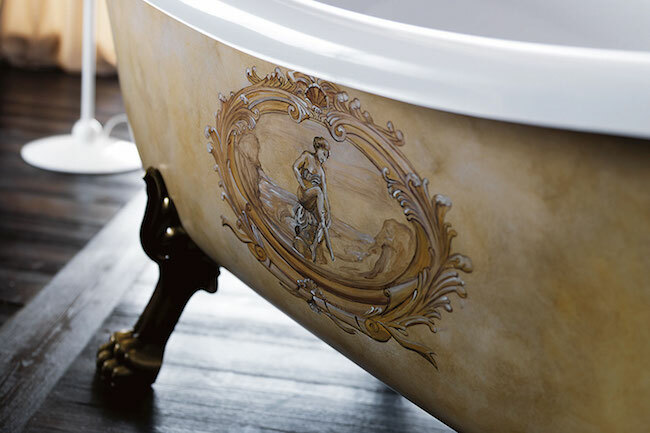 A classical touch given to the bathtub always look exquisite. 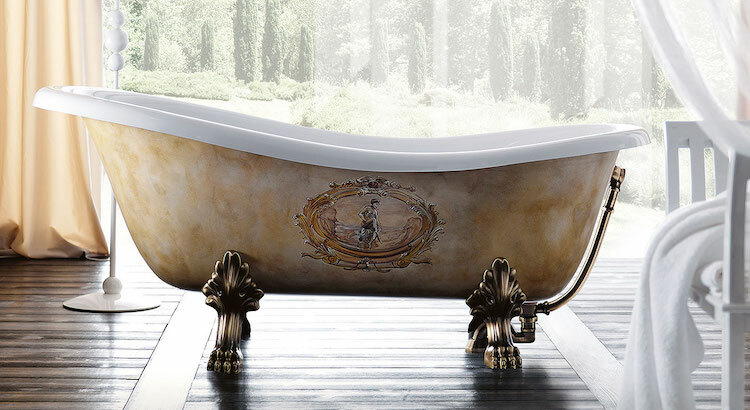 This is a beautiful bathtub with classical style metal feet, unique painting that you can also customize and comes in 4 colors : White, Chrome, Gold and Bronze. 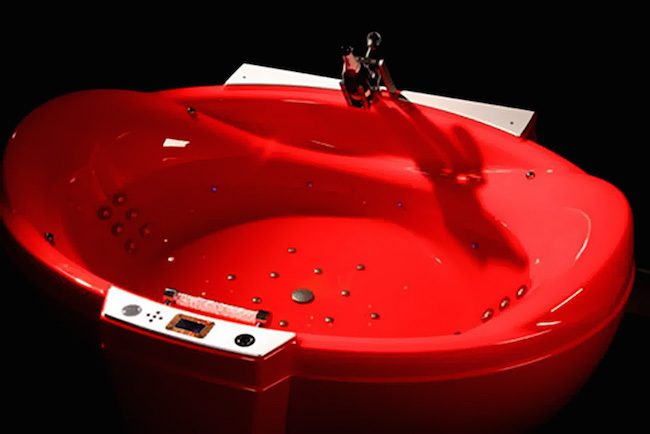 Another unique and expensive bathtub that is made only on order and will cost you around 77 thousand dollars. 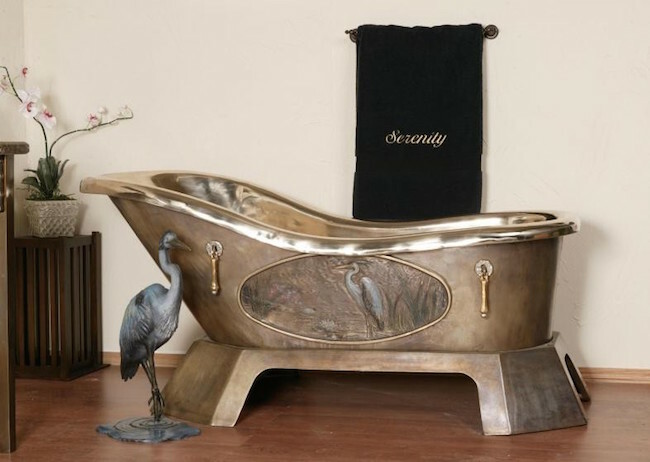 Serenity bathtub is made from solid bronze with beautiful carving in the middle of the bathtub. 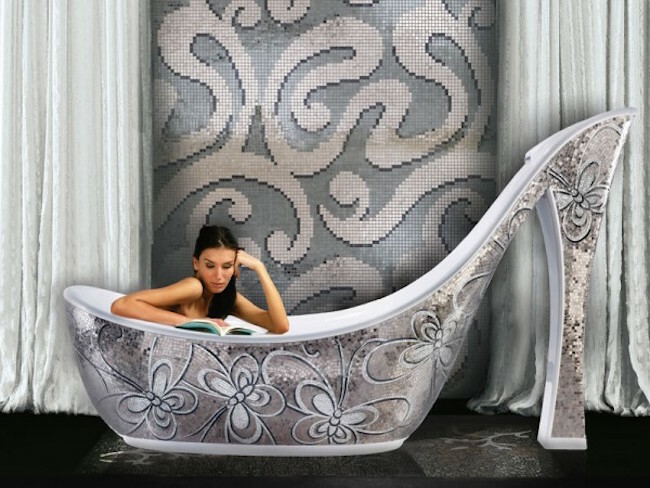 This unique bathtub design deserves to be on top of the list because of it is inspired from Cinderella shoe and looks awesome when placed in your luxury bathroom. This is a creation of Italian designer Massimiliano Della Monaca and will cost you around $17000. Another unique shaped bathtub that comes from the PSCBath.com that you can place in your bathroom in two styles as shown in the below images. 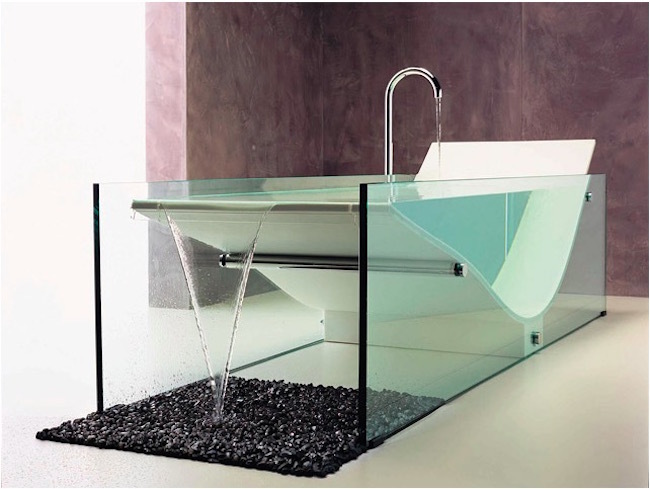 This is one of the most stylish and expensive bathtub we have seen in the recent times. Designed by Aldo Puglielli, it comes with a hefty price tag of $47,200 and features multicolor lighting, 42-inch two waterproof HDTV, massive gold frame console and Swarovski crystal embedded on champagne holders. Want to dive in your bathtub like brave Vikings. 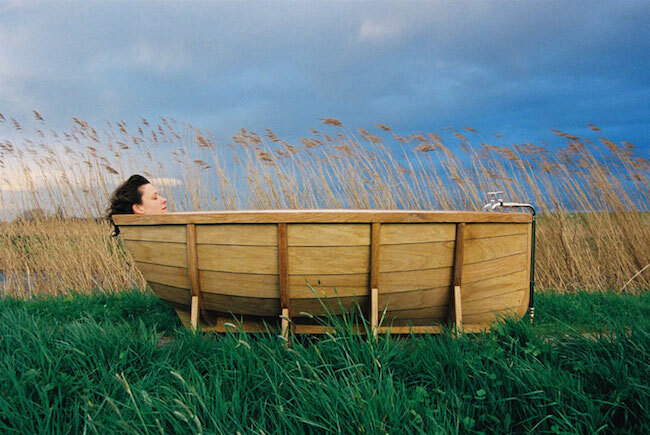 If your answer is yes, then you should go for a Viking bath boat designed by Wieki Somers which is made of Wood and designed as a Viking boat. 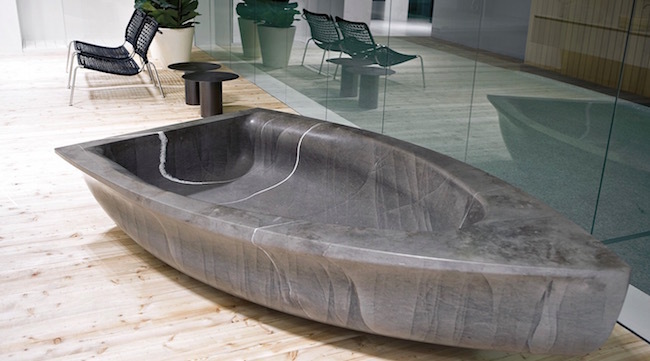 Another boat shaped bathtub designed by Anne e Patrick Poirier that is made of stone and will be appropriate for large bathrooms as it weighs 1.600 KG with 400l capacity. 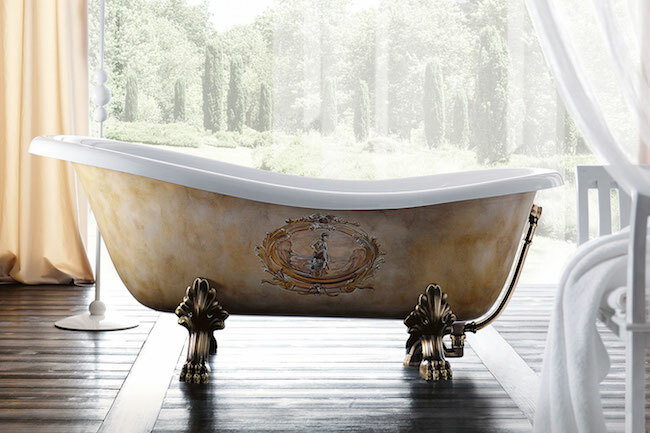 This is a limited edition bathtub and you can customize it with a name which can be carved at stern. 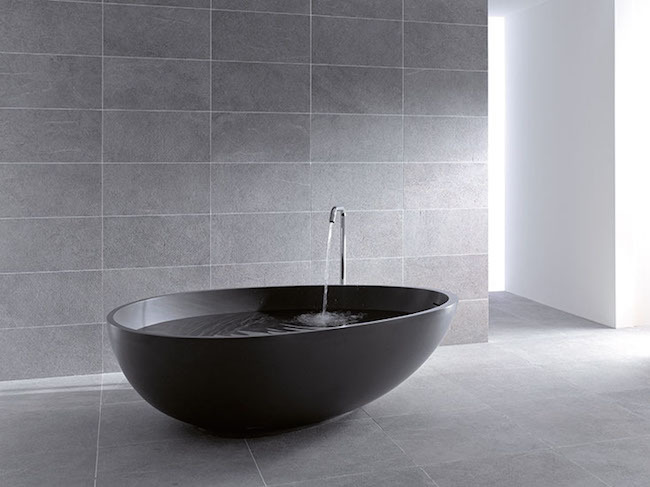 Designed by Joseph Licciarsi, Le Cob is a minimal style bathtub that is inspired by Le Corbusier’s Chaise lounge. It gives a soothing effect when water falls onto the pebbles below and sounds like flowing river. 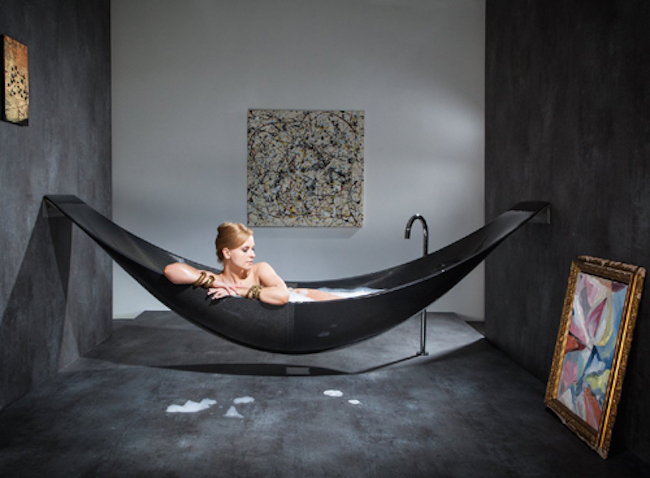 Designed by MastellaDesign, this is a dark color bathtub with unique egg-like shape. It has a unique feature, i.e. it is made of recyclable material called Cristalplant. Time to get romantic! 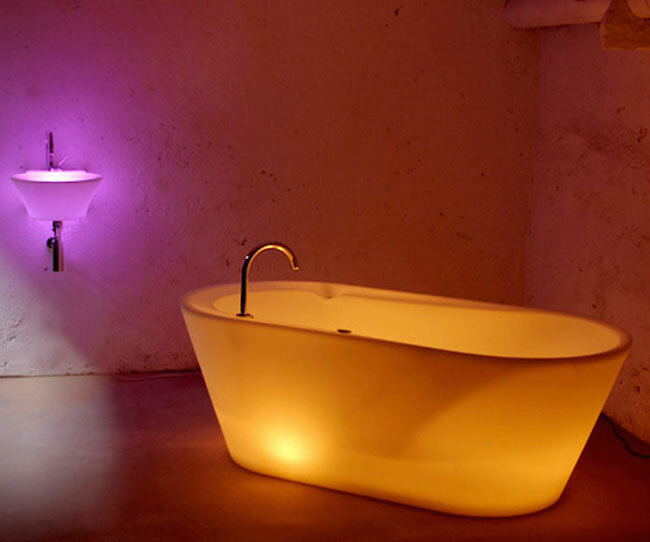 Designed by Jan Puylaert, this is one of my favorite bathtub inbuilt with neon-lighting systems that looks soothing to eyes. 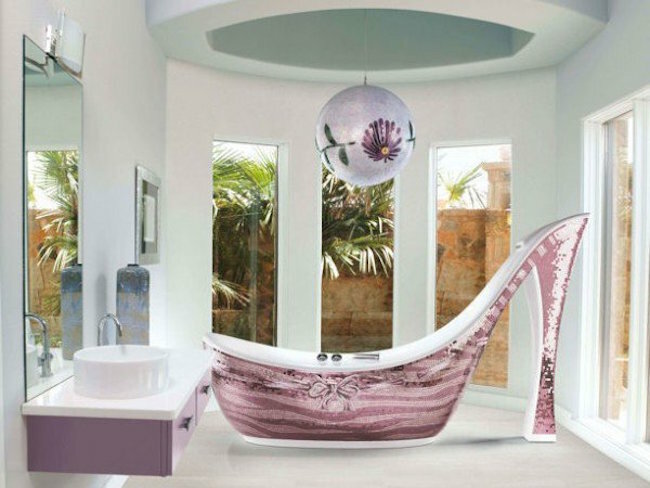 I am sure your lady will also love to have this bathtub in the home. Bathtub also comes with color options that you can choose according to your bathroom color : Yellow, Orange , Pink, Red and White. If asked I would go for Red Diamond Hottub. 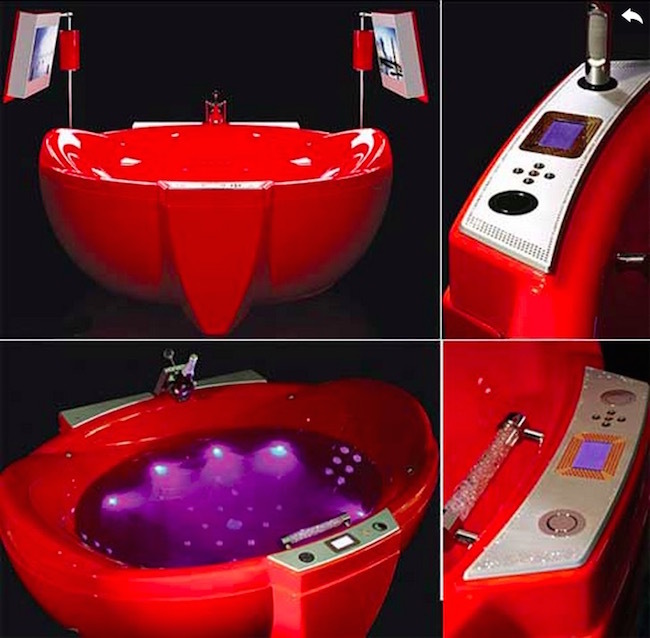 Which one would you choose from this collection of most unique bathtubs? “Most unique”. Unique is an absolute and means “one of a kind”. Something cannot be a bit unique, quite unique or very unique. That’s a stupid as saying someone is a little bit pregnant. The word you want is “distinctive”. Please don’t insult your readership but propagating this monstrosity.